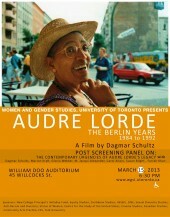 Toronto Premiere of: Audre Lorde: The Berlin Years 1984-1992 by Dagmar Schultz. This event is part of the Women and Gender Studies Institute’s 40th anniversary series. ALL EVENTS ARE FREE AND OPEN TO THE PUBLIC. PLEASE ADVERTISE WIDELY.